11:07 a.m. – A citizen came into the police department to report fraud. 4:28 p.m. – a cat was reported lost from a residence on Fernald Road. 5:09 p.m. – An officer assisted the fire department on US Route One. 5:29 p.m. – An injured fawn was reported on Wilson Road. 5:31 pm. – An alarm from a location on Old Dennett Road was investigated and found to be a false alarm. 6:41 p.m. – The area of US Route One and Route 236 was checked for a vehicle that was reported to be operating erratically. 7:47 p.m. – Assistance was provided to another department. 11:43 p.m. – An officer checked on suspicious activity they observed on Gorges Road. 11:48 p.m. – The K-9 officer assisted another agency. 7:17 a.m. – An alarm from a business on US Route One was determined to be a false alarm. 9:07 a.m. – A motor vehicle accident involving two vehicles occurred at the intersection of Woodlawn Ave and Bicknell Street. 10:46 a.m. – A resident came into the police department to report a fraud. 1:18 p.m. – A lost article was found on Cook Street. 1:23 p.m. – An officer responded to Manson Ave for an animal issue. 4:41 p.m. – A theft was investigated on Love Lane. 4:44 p.m. – A motor vehicle accident occurred on Route 236. 5:29 p.m. – An officer responded to Ledgewood Drive for a noise complaint. 6:06 p.m. – Officers assisted with a civil matter on Dana Ave.
6:20 p.m. – A report of harassment by telephone was received. 7:24 p.m. – A dog was reported at large on Boush Street. The dog was gone upon the officer’s arrival. 11:04 p.m. – An officer checked on suspicious activity they observed on Shapleigh Road. 6:21 a.m. – A noise complaint was received from Ox Point Drive. 8:41 a.m. – Allyssa F. Vaughn, 22, of 59 Acme Road, unit 6, Brewer, was arrested on another agency’s warrant. 11:55 a.m. – Assistance was provided to another agency. 3:06 p.m. – a two vehicle motor vehicle accident occurred on Water Street. 6:02 p.m. – A resident came into the police department to report a theft that occurred on Rogers Road. 6:31 p.m. – Following a motor vehicle stop on US Route One, Sean J. Noble, 41, of 77 Long Sands Road, York, was summonsed for violating condition on release. 8:42 p.m. – A wallet was reported lost on Government Street. 12:28 a.m. – Following a traffic stop on State Road, Joseph E. Walorz, 41, of 17 Sampson Place, Braintree, MA, was summonsed for attaching false plates. 1:02 a.m. – Officers responded to State Road for a noise complaint. 5:03 a.m. – An alarm from a business on US Route One was investigated and found to be a false alarm. 12:11 p.m. – Disorderly conduct was reported on Cutts Road. 2:17 p.m. – Following a traffic stop on State Road Nathan Theriault, 37, of 22 Everette Lane, Eliot, was summonsed for operating vehicle without license and possession of marijuana. 8:53 p.m. – Officers responded to Dismukes Street for a report of disorderly conduct. 10:32 p.m. – Assistance was provided to another agency. 10:46 p.m. – Suspicious activity was investigated on Whipple Road. 11:28 p.m. – A noise complaint was received from Woodlawn Ave.
12:08 a.m. – A noise complaint was received from Cole Street. 12:11 a.m. – Officers responded to Gorges Road for a report of disorderly conduct. Peace was restored. 12:16 a.m. – An officer checked on suspicious activity they observed on Old Post Road. 12:52 a.m. – Nikichia W. Harris, 35, of 71 Long Sands, Unit 3, York, was arrested on a warrant. 1:03 p.m. – Rebecca J. Guy, 51, of 23 Oak Ter. was arrested on a warrant. 1:15 p.m. – An individual came into the police department to report a lost article. 2:50 p.m. – Bethany German, 28, of 3 Colonial Road was arrested on another agency’s warrant. 4:20 p.m. – Officers responded to Cromwell Street for a disturbance. 4:39 p.m. – Suspicious activity was investigated on Manson Ave.
6:14 p.m. – A report was received of aggressive dogs on Hale Road. 6:52 p.m. – A report of a deceased seal on the beach was referred to another agency. 10:45 p.m. – AN officer checked on suspicious activity they observed on the I-95 Freeway. 1:26 p.m. – A motor vehicle accident involving two vehicles occurred on Wilson Road. 1:34 p.m. – Assistance was provided to another agency on the I-95 Freeway. 2:56 p.m. – A citizen came into the police department to speak to an officer regarding a fraud. 5:42 p.m. – A wallet was found on Dismukes Street. 5:51 p.m. – Nathaniel L. Perham, 32, of 10 Pettigrew Road, was arrested on a warrant. 6:33 p.m. – A resident came into the police department to report criminal mischief. 7:57 a.m. – An alarm from a business on US Route One was investigated and determined to be a false alarm. 9:42 a.m. – A citizen came into the police department to report criminal trespass that occurred on State Road. 10:27 a.m. – Officers responded to Martin Road for a report of a burglary. 2:30 p.m. – A resident came into the police department to report an attempted fraud. 5:26 p.m. – A motor vehicle accident involving two vehicles occurred on Route 236. 6:22 p.m. – Suspicious activity was investigated on Goodwin Road. 8:57 p.m. – Following a report of a domestic disturbance, Jesse A. Fisher, 25, of 7 Adams Drive, was arrested as a fugitive from justice. 9:57 p.m. – Following a report of disorderly conduct on Traip Ave Dennis Roberto, 47, of 4 Traip Ave was arrested for domestic violence assault. 10:20 p.m. – An officer responded to Cole Street for an animal issue. 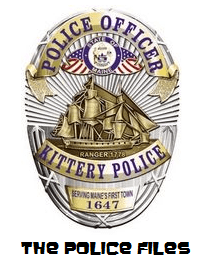 for all past police logs, visit the Police Department web site to see what’s happening in Kittery and the fine work the Kittery Police men and women provide at this link. This entry was posted in General Town News on September 18, 2015 by Chuck Denault.